Q17 - What type of shoe is best for archery? I am an archer from Italy and would like to know what the shoes are called on photo 64, page 126 of Total Archery. 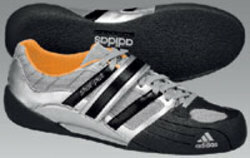 The shoes are called Adidas adiStar Shot Put Throwing Shoes. They have a flat sole and thin hard inner sole and we feel that this shoe provides for a greater stability than the average joggers that archers generally wear, which have spongy inner soles. Refer to http://www.everythingtrackandfield.com for more details.